I’ve got a few projects for you! 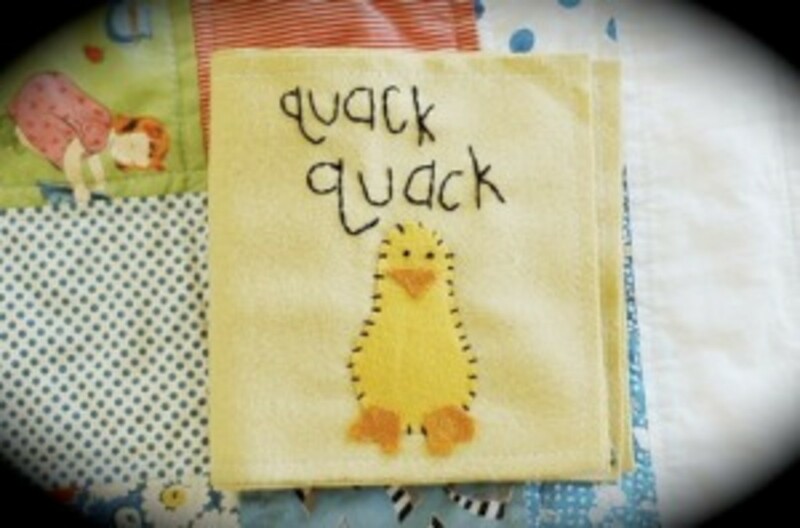 Below you’ll find simple step by step instructions for your own I Spy Bag and DIY Quiet Books. My career in motherhood has been going strong for almost 7 years now (and apparently won’t be in retirement for quite some time!) and throughout these years I’ve learned a thing or two to avoid those ugly moments in the car or other conditions of childhood boredom (i.e. church, waiting rooms, visits to child-free homes etc). Number one rule of most importance: SNACKS! Number two: keep those little hands busy (so as to avoid sibling fist-fights, lifting of mama’s skirt in public, nose-picking and other nasties that will undoubtedly cause a meltdown from either the children or yourself!). My 2 & 6 year old are both always happy if they can draw. In the past, this has often meant digging at the bottom of my bag for a blunt ikea pencil and an old receipt! 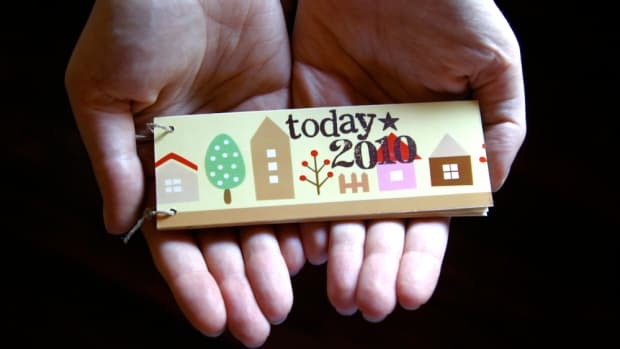 Whenever I can, I gather up all our scrap paper, hack it into smaller pieces and staple/fold & stitch/ring-bind the pages together to create little notebooks for the car and my bag. If I keep a bunch of them all over the place we are saved from the whines of boredom. 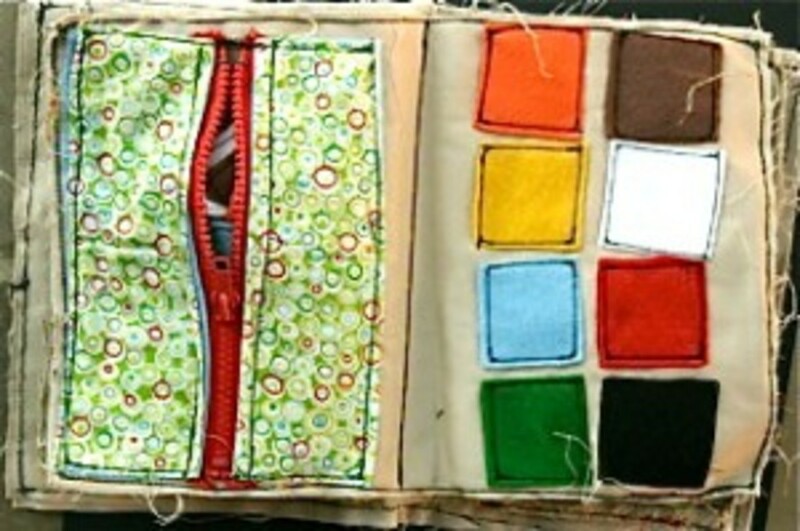 Crayons can be kept in a Tupperware container in the car, or a small felt bag to throw into your purse – or tie a long piece of yarn to a pencil and attach to the spine of the book so there is always something hand for drawing! Kids (older ones!) can have a lot of fun with a ball of yarn – keep a small ball handy for finger knitting*, making twisty twirlies (have two pieces of yarn together, two people holding each end. One twists one way, the other twists the other way until they are nice and tight. Let go – you have a twisty twirly! This can make a beautiful necklace or decoration! ), braiding, playing cats-cradle type games. Younger children can use thick yarn for weaving around pine cones. Children love books about themselves and those they love – it doesn’t have to be anything fancy either! Gather some photographs of your child, other family members – even pictures of your child’s favorite toys (be sneaky and take photos of teddy and dolly doing funny things around the house) and then laminate them back to back (or create your own plastic sleeves with acetate sheets and stitching like in my article ‘Capturing the little things’, punch holes and tie with ribbon/yarn/bookrings to keep handy in the car or your bag. What child doesn’t love a good treasure hunt? My project for you this month is a simple treasure hunt bag that can be taken with you and whipped out for fun and games when you most need it! 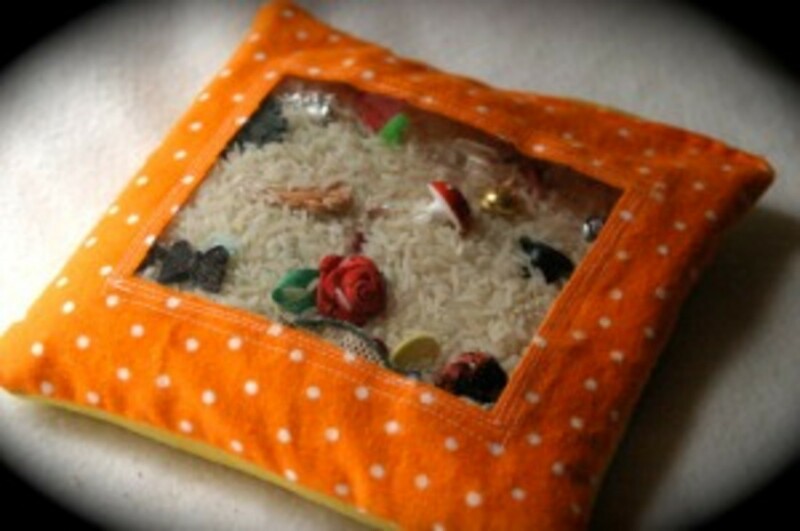 This project can be as individual as you (or your child), and even as simple as filling a plastic bottle with the rice and treasures if you are not keen to attempt sewing (just make sure you glue the lid on!). 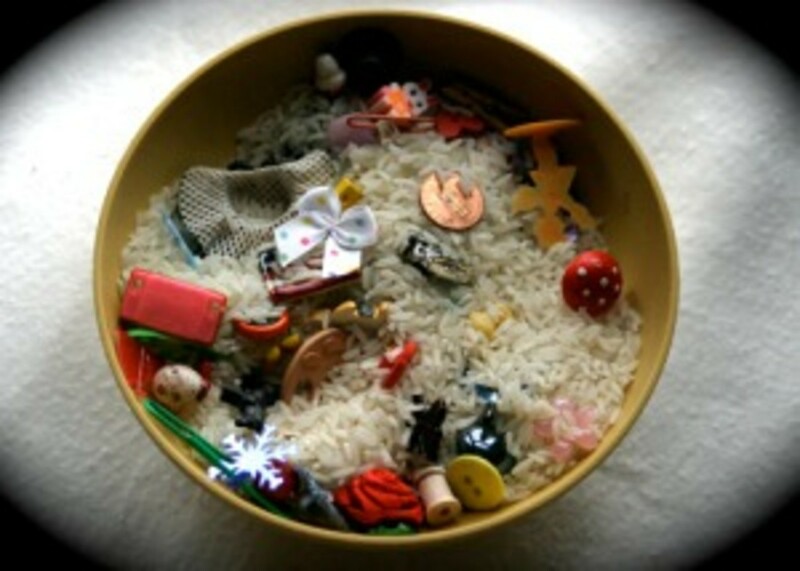 1.Lay out all your tiny treasures and write a list of each item before putting them into a bowl with the rice. 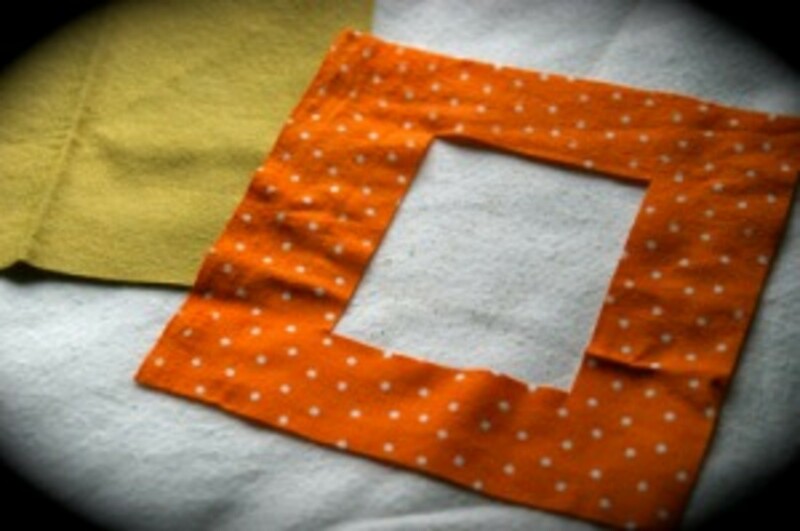 2.Cut your front and back pieces of fabric to size (each the same, I used flannel and wool felt as it’s nice and sturdy), then fold front piece in half to cut your ‘window’ out. 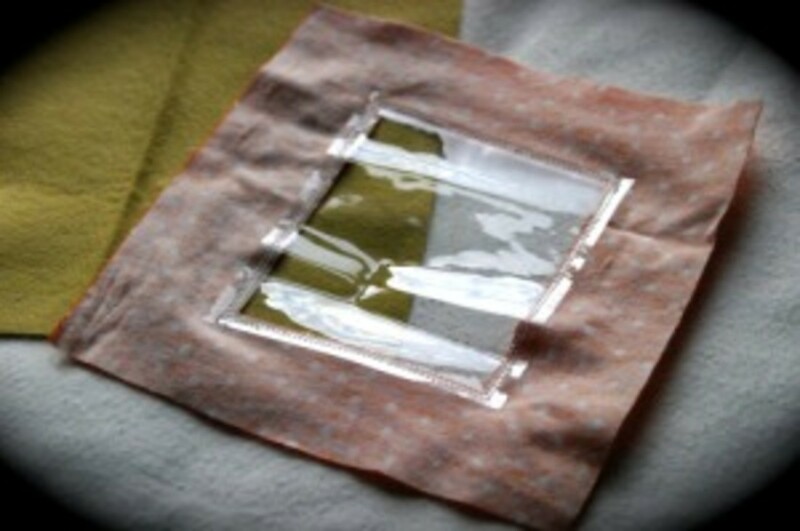 3.Sew plastic to the back of the window using a tight straight stitch. To be sure nothing escapes, I went around the window three times. 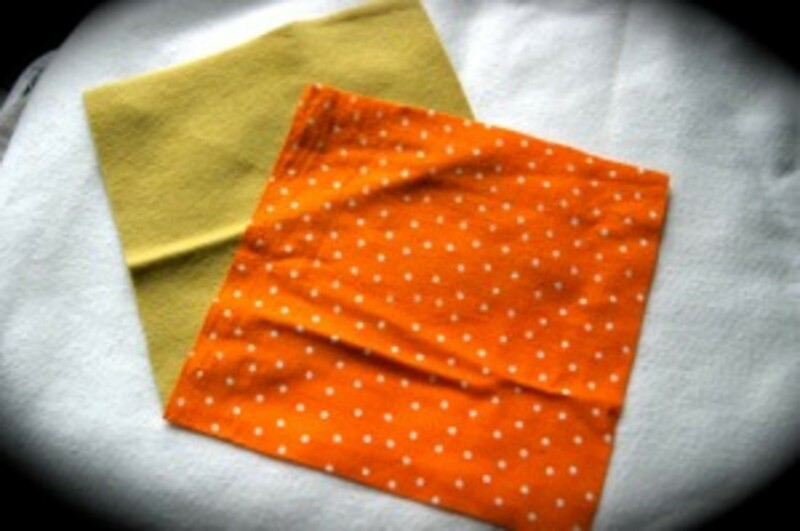 4.Lay front and back pieces with right sides together, and stitch around 3 sides and half of the 4th side. 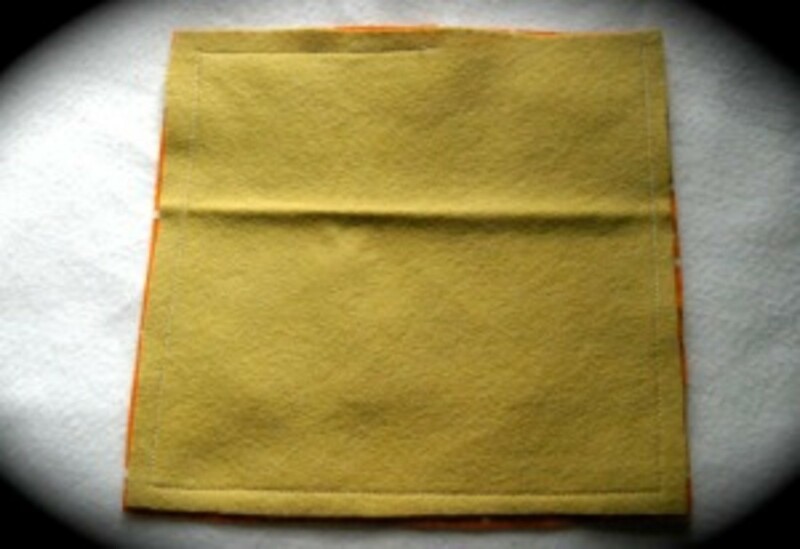 5.Flip right way out, and using a sieve or small cup pour the contents of the bowl into the bag. 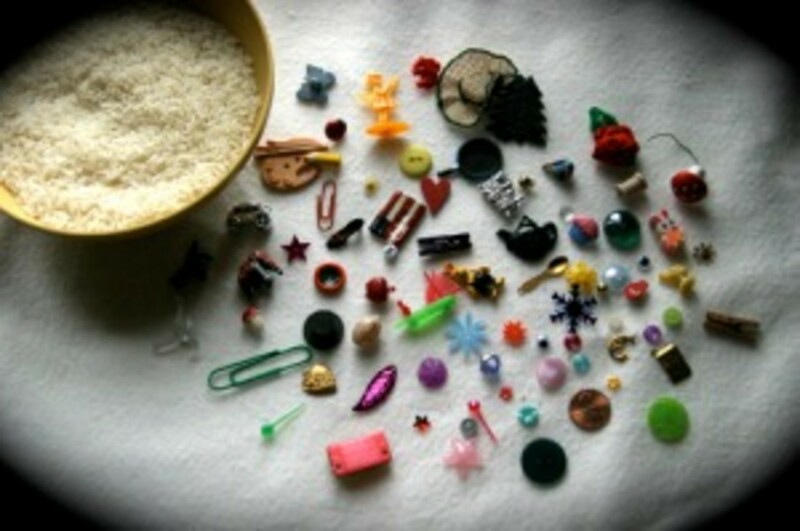 6.Shake rice/treasures to the bottom and carefully fold in the bag opening and sew up. 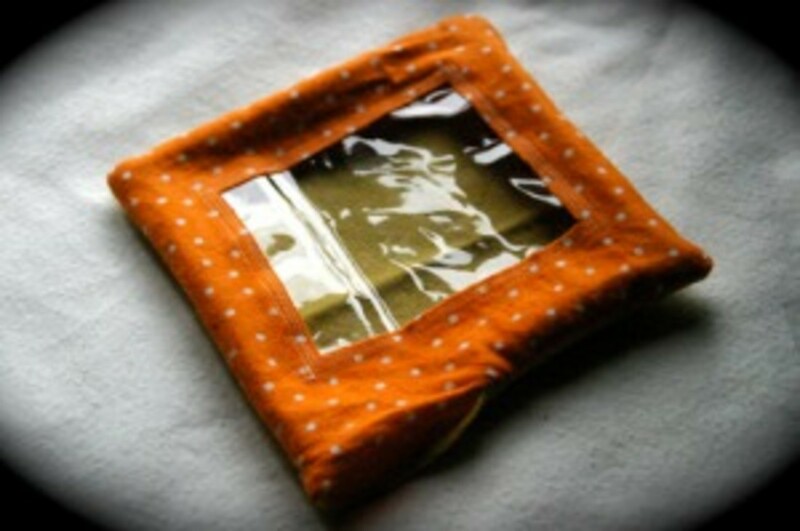 7.Print out the list of treasures to keep with the bag (perhaps laminate and tie to a corner of the bag) so the hunting may begin! Liz Eaton of The Anywhere Studio is mama to a busy little boy. 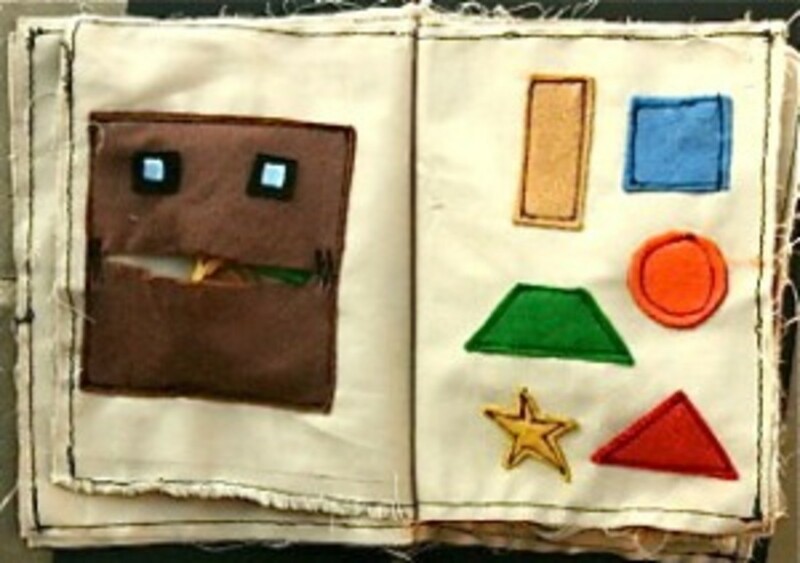 To provide entertainment for him in the car/doctor’s office/church etc she fashioned a funky little quiet book from fabric, felt, hardware and notions from the craft store and home depot. 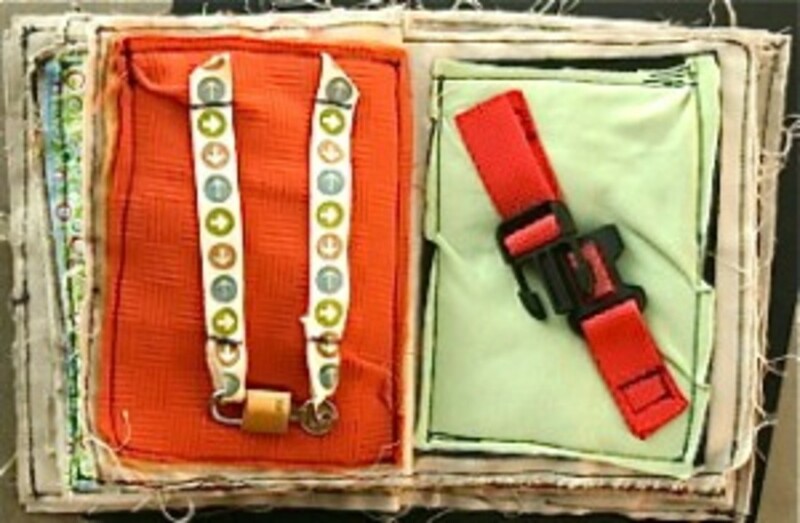 Buckles, clips, zippers, pockets and Velcro all provide fun interactive activities for busy little hands. 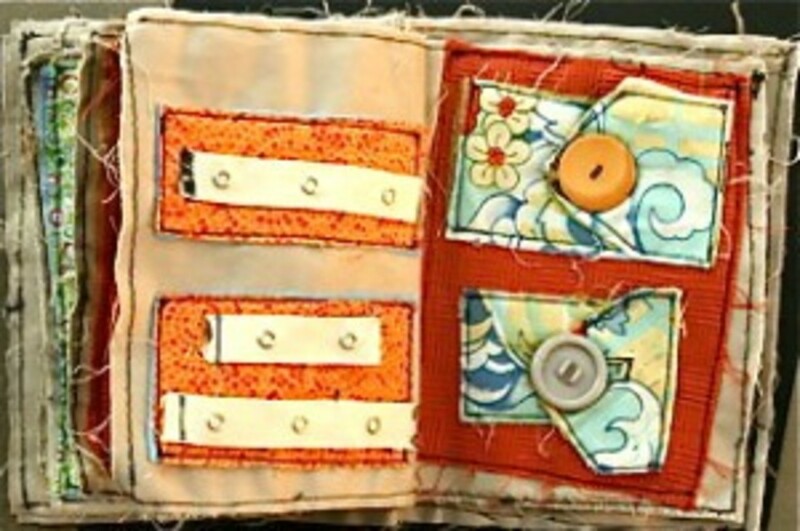 With a base of sturdy canvas for the pages, Liz used her sewing machine to attach all the different pieces and then stitched the pages back to back and down the middle to create a spine for the book. 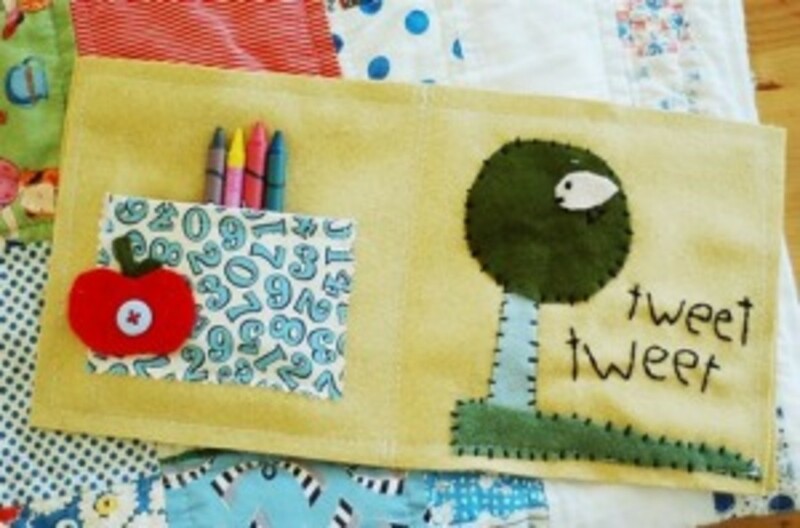 Her rough edges and ‘imperfectly-perfect’ sewing go to show you don’t need to be a seasoned seamstress to make a fun book for your kids! Grab a bunch of scraps and some things they can pop on and off and you have yourself a lifesaver for traffic-jams! 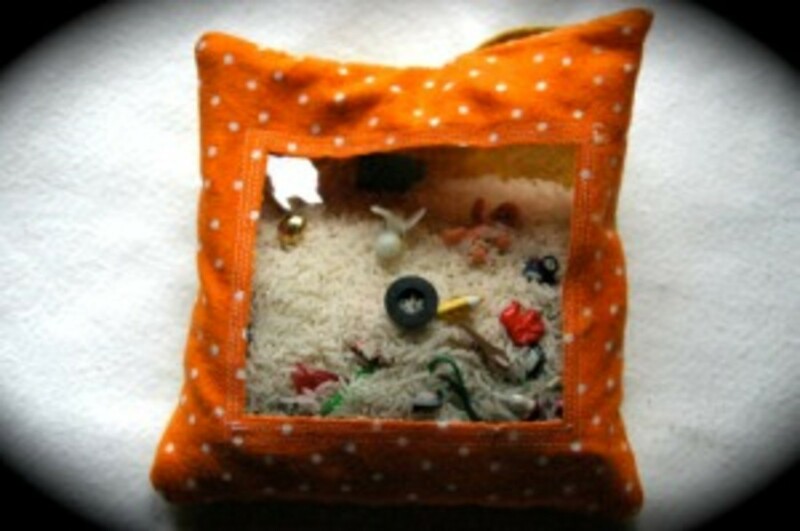 Kelly McCaleb is mama to a sweet 6 year old girl and a lover of all things handmade. 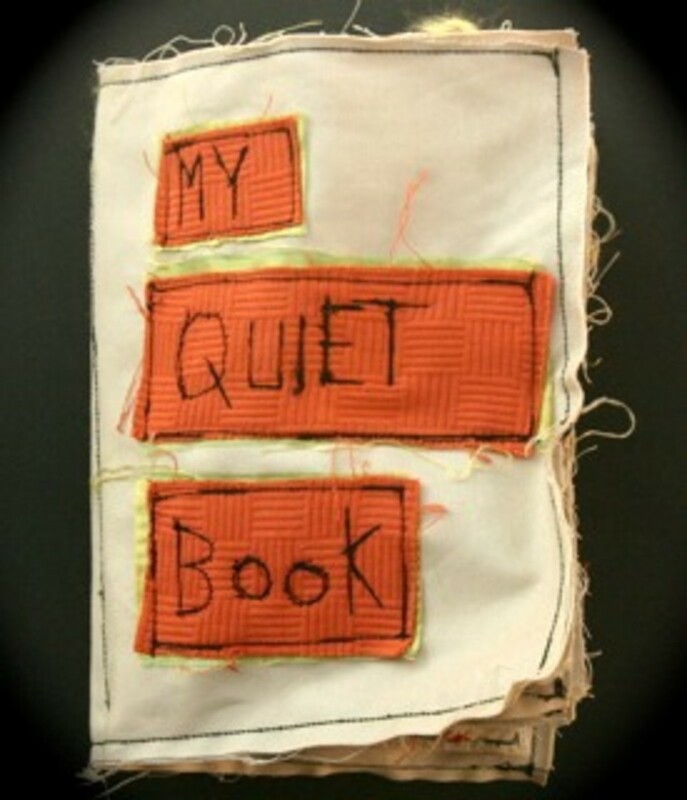 Using pure wool felt (available from quilt stores, or try thrifting for wool sweaters etc) and her delightful imagination, she created a sweet quiet book reminiscent of something great-grandma would have hand-sewn by the fireplace! 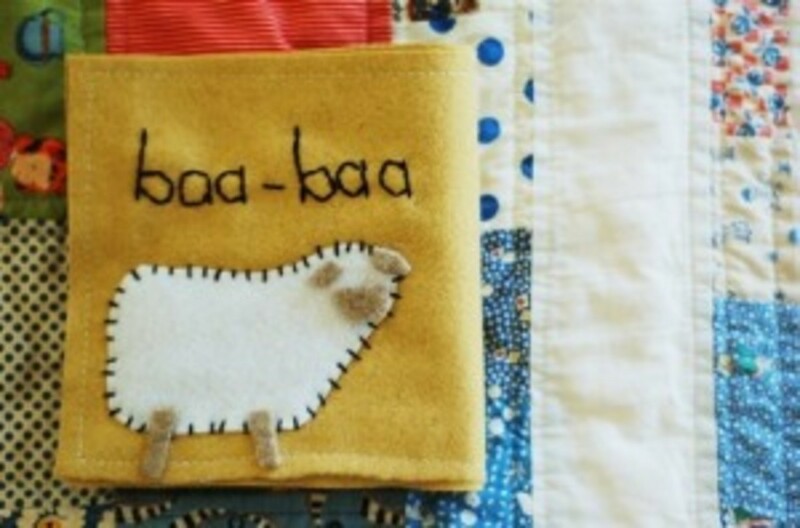 Simple shapes have been sewn on to create cozy animals, and charmingly hand embroidered words are great for children learning to read. 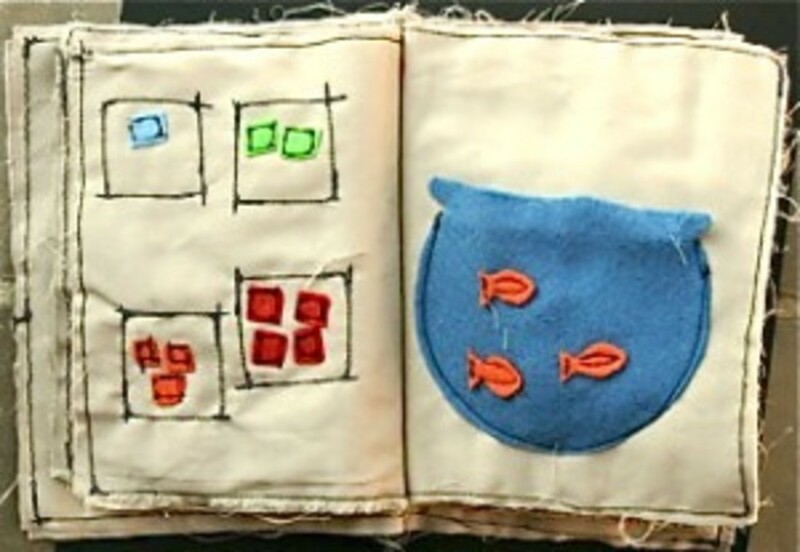 After each page was created by hand, Kelly lined them up back to back and stitched together (around the outside edge) on her sewing machine and then through the middle to bind it into a soft book. In our media-overload world it’s lovely to see our children amusing themselves with simple things and not always resorting to the TV or gameboy. With a bit of imagination and preparation you can create simple and wholesome activities for your children to keep them (and you!) happy. 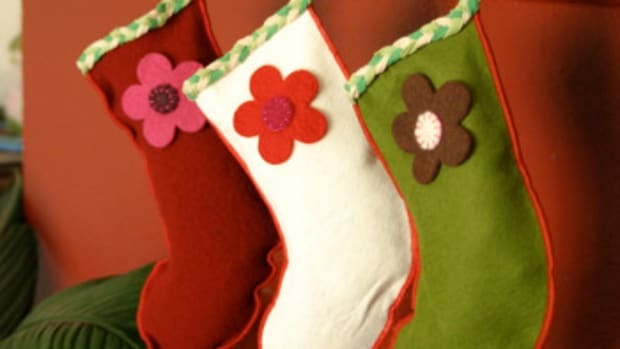 Have your children help make ‘happy bags’ for the car (maybe they can hang over the back of the seat in front of them) with their new playthings in, or get together with some other mamas and have a craft-fest to create some of these projects together. You’ll love sitting peacefully in the dentist office next time while your children angelically sit beside you playing – who knows you may even get to read a trashy magazine! Have fun! *there is a great link here with picture tutorial on how to do a simple chain finger knit. Unless you're Ansel Adams, most new consumer-grade cameras will provide you with enough pixels and therefore, sharpness for the images you need. So how do you select a camera? First off, you need to touch some actual cameras and think about a few things. I'll let you in on a little secret. 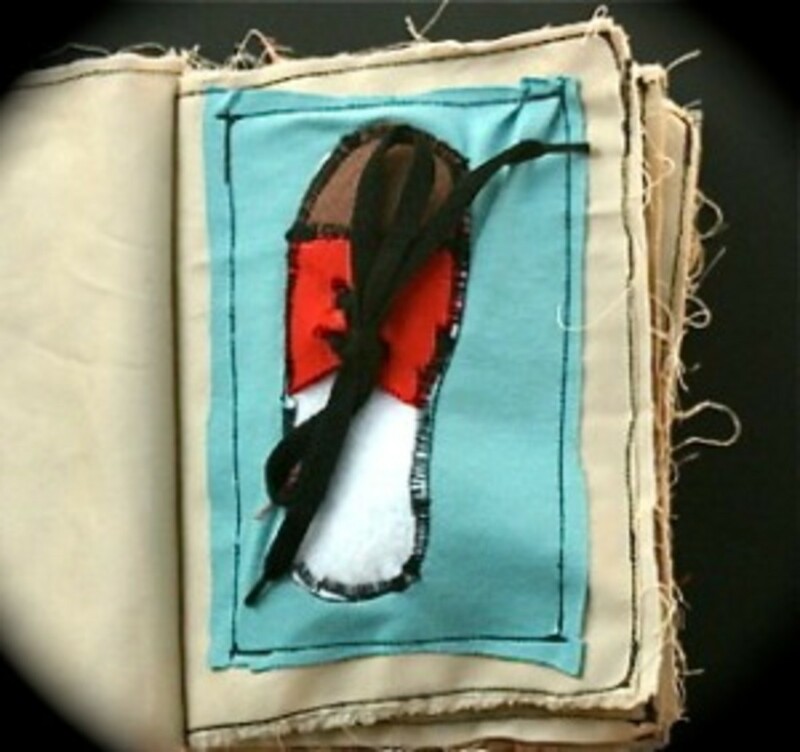 While I love to be crafty, make books and go nuts with my sewing machine on my scrapbooks/journals - I'm not much of a sewer.